In the May 2013 issue of Military History magazine. 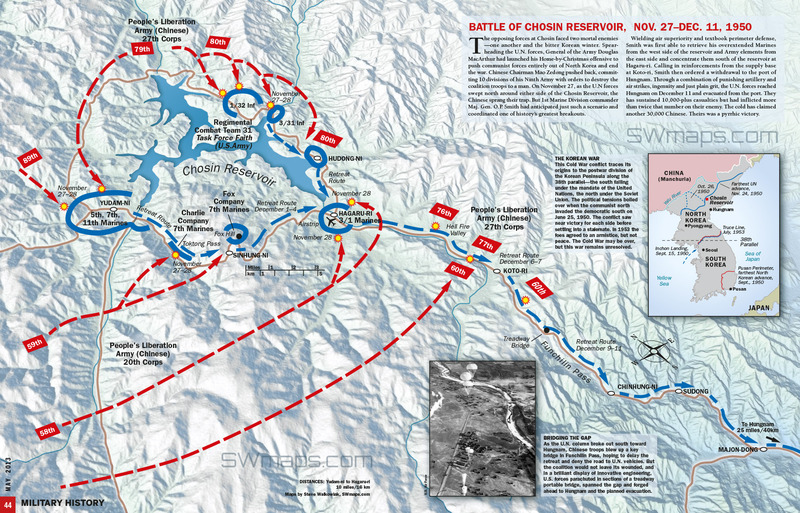 This map shows the Korean War Battle of the Chosin Reservoir in North Korea, November 27 to December 11, 1950. U.S. Army and Marines serving as U.N. troops, were positioned on two sides of a man-made lake. Surrounded by attacking Chinese forces outnumbering them eight to one, they had to fight their way out over hostile terrain–retreating 78 miles to the south in temperatures below minus 30 degrees. The survivors of this mission are referred to as “The Chosin Few.” I met one of them recently at my mother-in-law’s assisted living facility. “Mr. John” pulled a card out of his wallet one day that said “The Chosin Few.” This was a couple months before I received this assignment, so I hadn’t even heard of the battle before, but I went home and read a little about it. It was a coincidence that this project came up when it did. “Mr. John” served with the 7th Marines, which were stationed at the furthest point on the northwest side of the reservoir. At the time that I was finishing this map, Google released it’s crowd source map of North Korea and was allowing public input of locations. 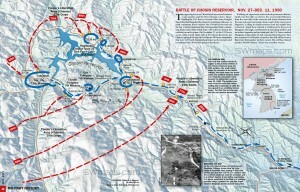 I was able to submit the Battle of The Chosin Reservoir to this map. 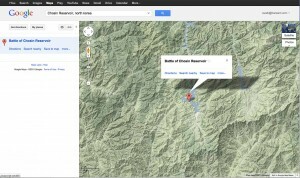 It is the only thing identified within a very large empty area of North Korea.